Julia’s R&D department, together with the biggest machine producer, has carried out an extensive study of the cutting process of toilet paper. Our goal was to develop an innovative log saw blade with a special profile that could reduce the friction and the temperature during the cutting process. Now we are happy to offer a special product with a new axial geometry and an excellent smooth surface. This new profile, combined with very low axial and radial run out, engraved on every single blade, enables exceptionally clean cuts and the best cutting performance together with a long knife life. Our blades are designed for high speeds up to 300 strokes per minute. 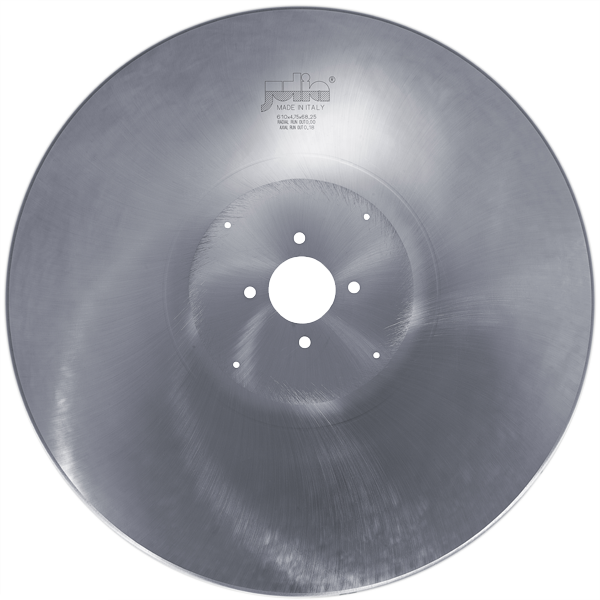 Our log saw blades are designed to cut toilet paper, kitchen paper, and many more tissue items. These knives can be used on the following tissue saw machines: Fabio Perini, PCMC, Gambini, Futura, MTC, United Converting, Maflex, MTorres Tissue, Bretting, BaoSuo, Italconverting, Kawanoe Zoki, Dechangyu, Zambak Kagit. Julia can also offer the correct grinding wheels for all types of machines to grind our high hardness knives. We impose strict process control standards on 100% of our products to ensure high-quality log saw blades every time. Due to our modern heat treatment, we have developed a special process to maintain uniform blade hardness and flatness of the saw blade. Thanks to our R&D department we developed a particular heat treatment process to reduce deformations, and guarantee log saw blades that are more stable during cutting, even if the temperature in the cutting area increases. As our customers know, log saw blades stability during the cut is of paramount importance; this is the main pre-requisite for obtaining a good finish and a long saw blade life. 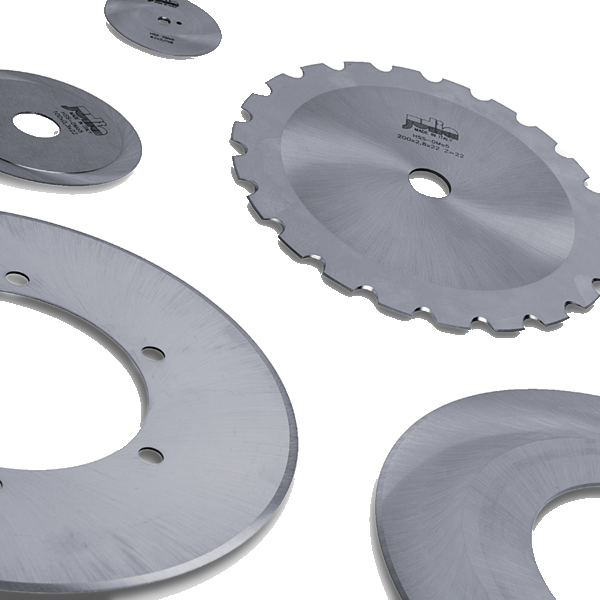 The Julia log saw blades go through rigorous grinding and beveling operations to ensure superior surface finish and dimensional accuracy. Our blades have a special axial geometry and surface finish to reduce friction and the cutting temperature. The extensive variety of knives we produce for various applications range from a minimum diameter of 25 mm to a maximum of 700 mm and provide specific solutions for any cutting job. We have been manufacturing knives for over thirty years, to cut a great variety of materials, such as carton, plastic, rubber, cork, deep frozen goods, rubber pipes with or without metallic weft, carton tubes and foams. To obtain the best result it is important to define the required features of the tool. The knife material depends on what is being cut and on the customer’s productivity needs. Julia uses different steels which offer a wide range of solutions for all these applications. Knife shape is very important; standard shapes for ordinary applications are defined from the kind of sharpening, which can be single or double bevel. The circular knives are usually sharpened like a linear blade knife, and can be with or without teeth depending on the materials they have to cut. Technical advances in blade geometry and the experience we have acquired across several applications show that for some materials a specific tooth type or a particular notch considerably increase cutting performance. We normally manufacture knives to specific customer designs. For over thirty years we have manufactured knives to cut a wide variety of materials. We offer knives suitable for use in the production of corrugated carton board packaging, cardboard tubes, paper, deep frozen goods, cork, hoses with or without metallic braid, plastic rubber, foam, and many other materials. Our technical office design special cutting tools every day to suit the full range of our customers’ needs. We cooperate with the main machine producers and often carry out cutting tests during machine installations. We invite you to contact us for a solution to every cutting problem.